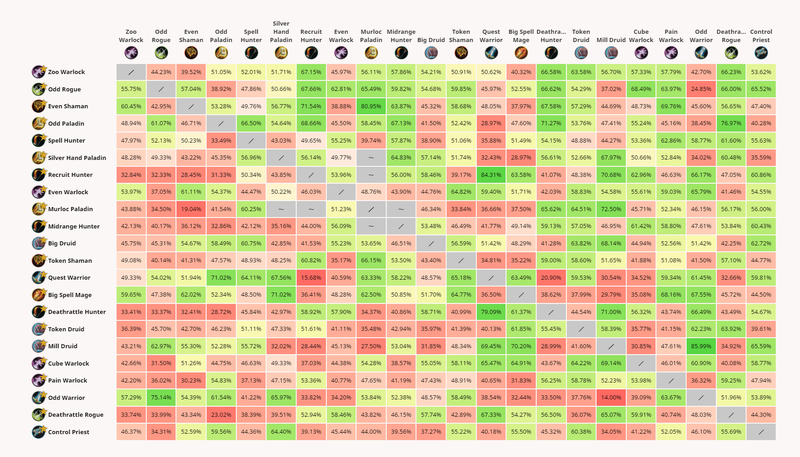 Day 2 of The Boomsday Project expansion has seen very little change in terms of what classes people are playing. However, we are seeing a large portion of the player base moving back to previously dominant deck archetypes in The Witchwood. 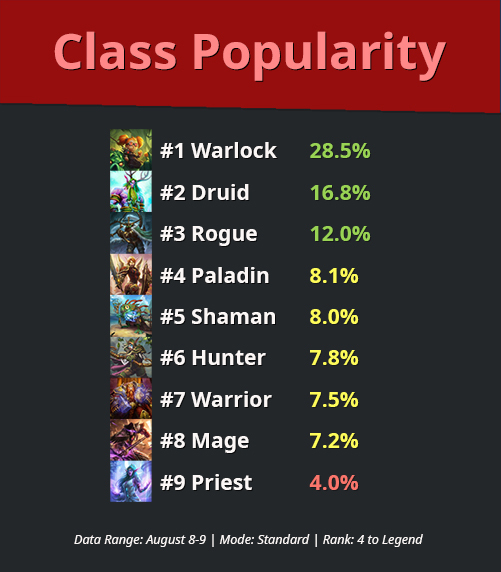 Here's a look at the Class Power Rankings after Day 2 of Boomsday. Not much movement here from Day 1. Warlock still holding strong with Zoo Warlock and Even Warlock. Druid rose a little bit with Token Druid, Big Druid and Mill Druid all making it into the Top 10 archetypes. Priest still struggling with Control Priest being the only priest archetype above 50% right now. We've seen very little movement here as well. Rogue has seen a slight tick up with Pogo Rogue and Deathrattle Rogue increasing in popularity. 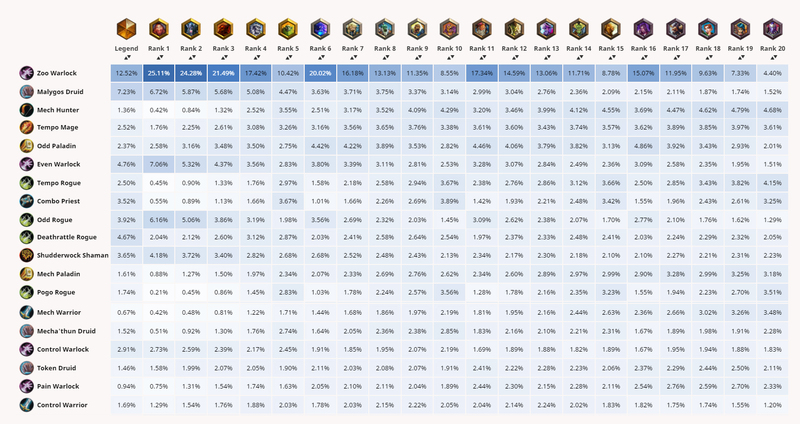 Mage has also a small increase with Big Spell Mage being played more with it's recent success. 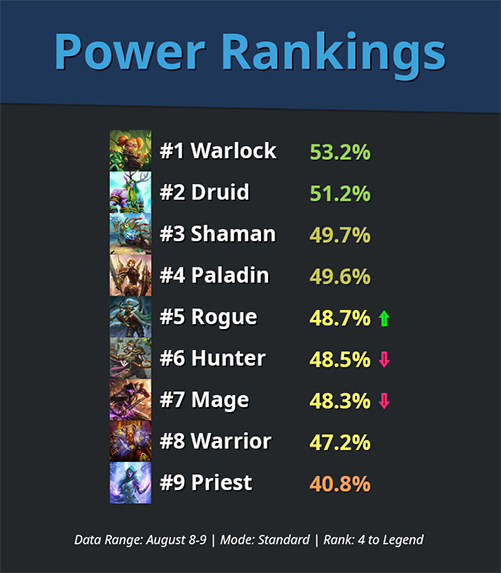 Even Warlock (62.6%): Look who's back! This deck has always been a huge favorite against any control and combo oriented deck and remains the same. With so many people trying out slow and new concept decks, you'll find your climb up the ranks a very quick one with this deck. Note that there are no new cards from Boomsday in this deck. Odd Paladin (60.8%): Here's another dominant deck we're seeing on top of the charts again. This one however does have a few new cards. Glow-Tron and Mecharoo give the deck even more sticky one drops guaranteeing a fast start. Turn 5 has always been a key turn for this deck for buffing small minions and solidifying the board. Wargear provides another solid option to do this on a single target. Quest Warrior (59.0%): With archetypes like Odd Paladin, Token Druid, and Big Spell Mage doing well right now, it's a great time to play Quest Warrior given the great matchups it has against these archetypes. The only new card we see in this matchup is Weapons Project which is used to negate some of the powerful weapons we've been seeing in other classes. It also has worked well helping this Warrior fight off aggro decks early and even providing a card draw combo with Harrison Jones later in games. Token Druid (58.9%): Once again, we see this deck continuing to rise. Giggling Inventor is proving to be one of the most useful cards in this deck and in the overall expansion. Floop's Glorious Gloop at times can still be a bit clunky, but the synergy it has with Swipe and the insurance it gives you in the case of a defensive board by your opponent make this card a viable consideration. Mill Druid (57.9%): We've seen the winrate on this deck drop ever so slightly with the rise of aggro decks in the last day. This deck is still one of the best to farm slow control decks. Day 2 has been the return of dominance of The Witchwood archetypes. Try some of these decks out and let us know on Twitter how you fare with them! Day 1 of The Boomsday Project is now complete! Let's take a first look at what everyone's playing and what is winning.